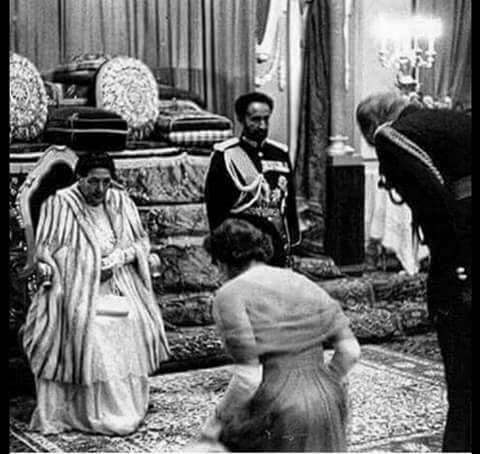 Rare photo of Queen Elizabeth and Prince Phillip bowing before the real original African Royalty...Empress Menen Asfew and her husband His Imperial Majesty the King of Kings of Ethiopia, Conquering Lion of the Tribe of Judah, Elect of God, Emperor Ras Tafari Makonnen Woldemikael Haile Selassie I of Ethiopia..
Today, Haile Selassie is worshipped as God incarnate among followers of the Rastafari movement (taken from Haile Selassie's pre-imperial name Ras—meaning Head, a title equivalent to Duke—Tafari Makonnen), which emerged in Jamaica during the 1930s under the influence of Marcus Garvey's "Pan Africanism" movement. He is viewed as the messiah who will lead the peoples of Africa and the African diaspora to freedom. His official titles are Conquering Lion of the Tribe of Judah and King of Kings of Ethiopia and Elect of God, and his traditional lineage is thought to be from Solomon and Sheba. These notions are perceived by Rastafari as confirmation of the return of the messiah in the prophetic Book of Revelation in the New Testament: King of Kings, Lord of Lords, Conquering Lion of the Tribe of Judah, and Root of David. Rastafari faith in the incarnate divinity of Haile Selassie began after news reports of his coronation reached Jamaica, particularly via the two Time magazine articles on the coronation the week before and the week after the event. Haile Selassie's own perspectives permeate the philosophy of the movement.